The Ram Mandir is situated in the heart of the capital city. The most attractive feature of the temple is the spire rising above the central dome, which is visible from far away parts of the city as well. 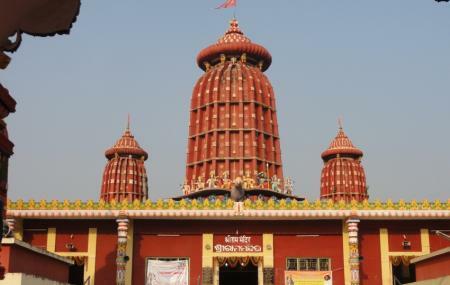 The temple is managed by a private trust and is the abode of beautiful statues of Lord Rama, Laxmana and Goddess Sita. The best time to visit this temple is during the festivals Ram Navami, Hanuman Jayanati, Vivaha Panchami and Dusshera. Make sure you follow the Hindu rituals like leaving your shoes outside the temple. However, during festivals the timings may vary. How popular is Shree Ram Mandir? People normally club together Biju Patnaik Park and Museum Of Tribal Arts And Artifacts while planning their visit to Shree Ram Mandir. The Ram Mandir is very popular and ancient temple in Bbsr. Very beautiful place. You find the peace of mind when you have any stress. All festival's are held on the place. There are some facilities for birthday party, marriage functions and death anniversary. Please come here to know more about this place. Nice peaceful Temple complex. Not very crowded. You can enjoy your visit on your terms. Very well maintained. Neat and clean. A regular temple with a vast space located in the prime area. Parking space not available since it is located near a main road. There is a sweet shop in one corner and a juice centre. It was closed when we visited (Sunday evening). Very nice temple. Only place in Odisha where the priests are very good n you will find none who are going to cheat you. Don't shop around the stores as they are extremely costly n the products are not at all value for money. The tiffin stall is a good place to eat though.